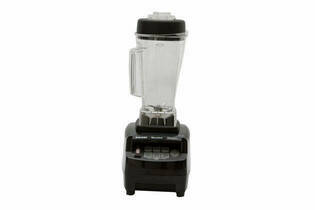 Snapshot: The Biochef High Performance benchtop super-blender has 3 speeds and comes with a plastic (BPA-free) jug. How does it rate? Excellent results in our soup-pureeing test. Very good results in our ice-crushing test. Good results in our carrot-chopping test. Excellent results in our green smoothie test. Very good results in our kale test. Very good results in our nut butter test. Very good results in our sorbet test. Controls are easy to use with indicator lights. Jug can be placed on the unit in any position. Blended soup can be heated (only to a warm temperature). Poor results in our dough test. Jug can be unstable when it’s on the unit. Unit can jolt and vibrate when mixing a heavy load or mixing for an extended time. Jug is large (so can be difficult to wash in a domestic sink). Jug is plastic (so may stain). Liquid can be pushed up into lid so may drip when removing lid. Blade housing sits too high in jug so food can become trapped. 23 May 2015, Julia S.